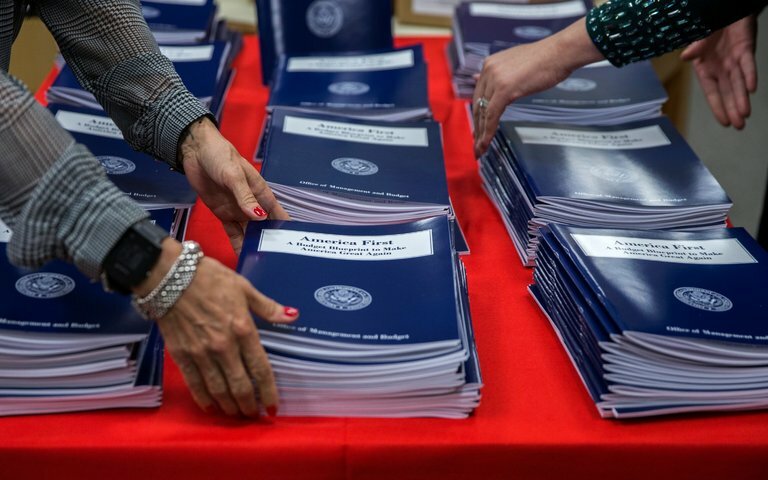 The White House released President Trump's budget plan this morning. The budget makes major cuts to the State Department and the EPA, while eliminating funding to the National Endowment for the Arts and 18 other departments. It designates additional funding to the Department of Defense and Homeland Security. The budget proposal is just that, a proposal. It still has to make it's way through Congress and may well see lots of changes before it's instituted. See other news featured by AllSides such as Judges Rule Against Travel Ban, Trump’s 2005 Tax Returns Revealed, CBO Report on the AHCA and the latest AllSides News. "The winners in Trump’s proposed budget are the Defense Department which would see a $52.3 billion increase, the Department of Veteran’s Affairs which would see a $4.4 billion increase and the Department of Homeland Security which will see a $2.8 billion increase. Trump’s budget requires approval from Congress. 'The administration’s budget isn’t going to be the budget,' said Sen. Marco Rubio, R-Fla. 'We do the budget here. The administration makes recommendations, but Congress does budgets.'" "Trump’s budget wouldn’t just cut off food for seniors and housing assistance to the poor, it also has it in for job training and education. Not only would the budget slash training for unemployed youth and displaced workers, it has another strong message for seniors. And that doesn’t even touch on some of the real fun of the budget. Like ending support for both NPR and PBS. Destroying the EPA’s ability to enforce the Clean Water or Clean Air Acts. And of course, gutting the State Department to free up more dollars for weapons, because it’s always better to fight a war than talk your way out of one. Trump’s budget also completely does away with the endowment for the arts and cuts food for starving kids overseas right at the moment the worst famine in decades is kicking in. So the Trump budget kills not just arts and humanities, it also picks off lots and lots of humans." "Congress uses the president's budget as a starting point for writing its own bills. Since Republicans control the House, the Senate and the White House, there is a better chance this year that the final bill will look something like the president's outline than there is in times when the White House and Congress are held by different parties. House Speaker Paul Ryan, R-Wis., said the budget was a shift in the right direction after eight years of Democratic blueprints from the White House. 'We are determined to work with the administration to shrink the size of government, grow our economy, secure our borders, and ensure our troops have the tools necessary to complete their missions,' Ryan said. Senate Minority Leader Charles Schumer of New York signaled that Democrats would fight the proposal tooth-and-nail."